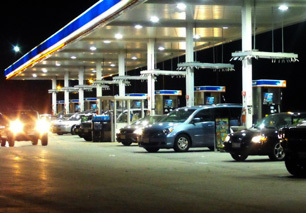 MTBE was a common gasoline additive until the 1990s. The gasoline additive MTBE has been used since 1979 as a gasoline oxygenate to help gasoline burn cleaner. It was in wide usage as a substitute for lead in the 1990s until the realization that it was contaminating groundwater in many areas of the US led to its use being banned or severely restricted. MTBE has now been replaced largely by ethanol, but is a persistent pollutant that can remain in groundwater for many years. EPA's Office of Water has concluded that available data are not adequate to estimate potential health risks of MTBE at low exposure levels in drinking water but that the data support the conclusion that MTBE is a potential human carcinogen at high doses. MTBE is best removed from water by activated carbon, with coconut shell being the preferred carbon—in most cases coconut shell carbon has a 2.5 times higher capacity for MTBE removal than bituminous carbon. Even so, sufficient contact time is essential for effective removal. A 12 x 30 or 12 X 40 mesh size is normally used, and this supports a flow rate of about 1 gpm. Higher rates are possible with 20 X 50 mesh coconut shell, but pressure drop increases dramatically. For drinking water, many carbon block filters effectively reduce MTBE at a flow rate of 0.5 to 0.9 gmp.